It’s been a while since the last Royal Things blog post. However, I have been blogging for an innovative tech food distribution company - called Foodem. This company provides an online platform where restaurants can purchase a great variety and quantity of ingredients. The blogs that I write for Foodem are pretty straight forward. I visit a restaurant and write an article on my experience and the food. It’s fun and a great way to reflect on my dining experience. Blogging on food is what compelled me to revisit the Royal Things blog. On the Royal Things site, I am going to blog on fashionable places in towns that I visit. Given that I live in Baltimore, I am going to begin by blogging on places within the city. Today, I visited a fashion forward boutique called Poppy Stella. It is a boutique that has a range of clothing and accessories, as well as great prices. Poppy Stella is made up of two corridor-like rooms that both have shelves with handbags - tote bags, clutches . They also have shoes - heels, mules and sandals. 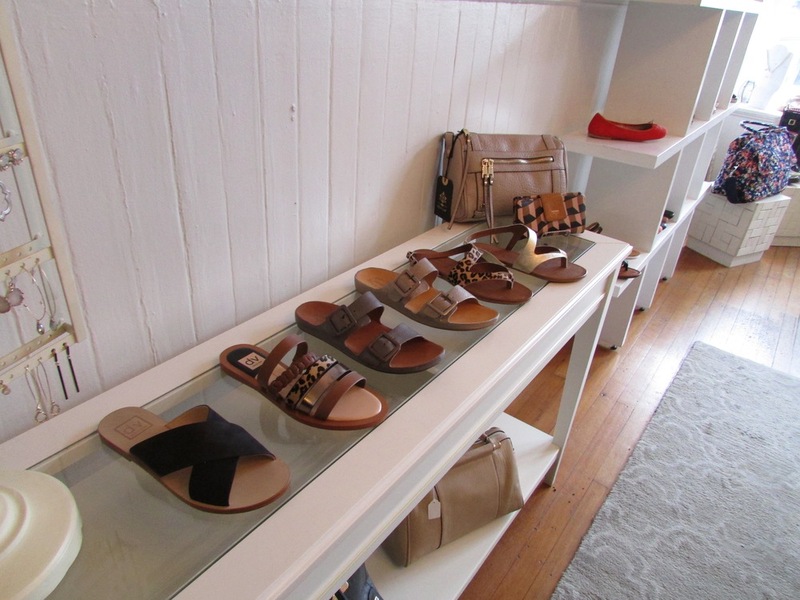 They even have Birkenstock like sandals - a shoes that I never thought I would like - that is until I saw them at Poppy Stella. I have to say that these Birkenstock shoes were the exception because they were gold and gold brightens up and adds value to just about anything. Each room also has a few racks of carefully curated clothing for the hip, suburban, meets metropolitan, girl or woman. There were many outfits that could be created for the girl attending a festival like Coachella. For instance, one could easily select one of their sleeveless off-white lace tunics (made by Sugar + Lips) and pair it with curve hugging jeans (as seen here: https://www.facebook.com/poppyandstella). You could also wear a black sleeved dress underneath to create the layered look. There are also plenty of other chic items like olive green jumpsuits and the ubiquitous airy maxi dresses. There is even some one-for-one action going on at Poppy Stella. Here, in addition to the great wearable items, they also have aromatic items. One of these items is a candle made by Feya Candles. For every candle purchased a meal goes to a child in a developing country. I am all about the socially-conscious items - even wore my TOMS today - and it was a pleasant treat to find an item with a mission to help communities and the people in them. Not to mention - the scents are so yum and refreshing. I thoroughly enjoyed my visit to Poppy Stella and would recommend that anyone with a sweet tooth for fashion head over to this Fells Point Baltimore neighborhood and spend some time (and money!) at Poppy Stella. For more information on Poppy Stella, visit: http://poppyandstella.com.